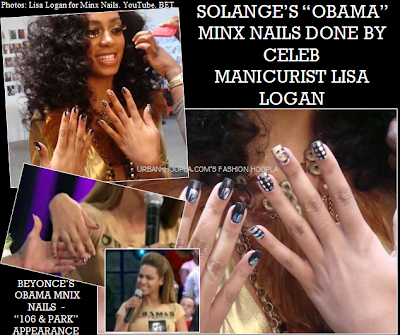 Beyonce also wore Obama Minx nails just like her sister Solange (see above) for her recent "106 & Park" appearance. The older Knowles sibling appeared on BET for the full show to release the video premieres of her singles, "If I Were A Boy" and "Single Ladies (Put A Ring on It)." Beyonce also confirmed that the dance moves seen in her "Single Ladies" video was inspired by the one take choreography seen in the legendary Bob Fosse/Gwen Verdon "Mexican Breakfast" clip which has become a huge YouTube sensation. Find more details of Beyonce's "I Am..." listening session over at Essence. Visit The Beyonce Network for the full interview. They are doing alot of wasting money on that nail mess. It's not that serious. I like the idea of the nails too because it's slightly different from the celebs rocking a tee-shirt of their favorite political candidate. I think it's very creative.